Finkelstein, Maxwell W.. "Pukaskwa National Park". The Canadian Encyclopedia, 25 January 2018, Historica Canada. 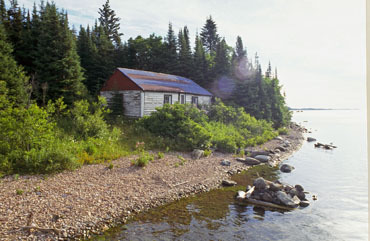 https://www.thecanadianencyclopedia.ca/en/article/pukaskwa-national-park. Accessed 19 April 2019. Pukaskwa National Park (designated 1978, 1877.8 km2) is bracketed on the west by the coastline of Lake Superior, an impressive stretch of massive headlands and beaches of golden sand or water-worn cobble. The name is of native origin but its meaning is unclear. 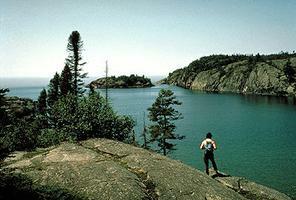 Pukaskwa National Park (Barrett & MacKay/courtesy Canadian Parks Service). The park is quintessential shield country, an ancient plateau of granite and gneiss riddled with rock-rimmed lakes dissected by tumbling rivers and covered by dense boreal forest. In this wilderness roam moose, black bear, wolves and smaller species adapted to the northern forest of black spruce, jack pine and white birch. A small herd of woodland caribou, rare in this part of Canada, roams the park. This herd is decreasing due to forestry operations and habitat change in lands adjacent to the park. Their decline emphasizes that, like in so many parks, habitat requirements for large mammals are not encompassed by park boundaries. The "Pukaskwa Pits" are evidence of early habitation of the park area. The purpose of these carefully arranged boulders remains a mystery. In the 17th century European explorers came, soon to be followed by fur traders and the logging industry. Today, Pukaskwa challenges the modern explorer to paddle its turbulent spring rivers or its wild coast. 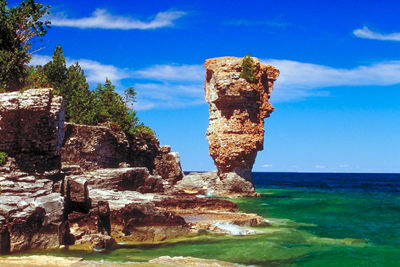 A challenging coastal hiking trail runs the length of the park. Backpackers can arrange to be dropped off or picked up by boat at one end of the trail. A vehicle-accessible serviced campsite is located in the park as well as primitive backcountry sites. Commercial accommodation is available in nearby Marathon, Ontario. 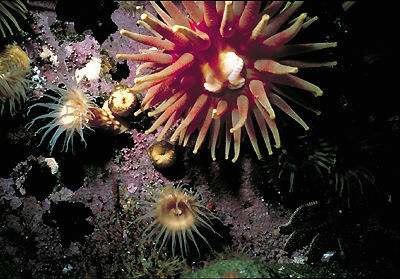 Pukaskwa National Park of CanadaThis illustrated Parks Canada website focuses on local aborigial history and recent resource management projects in Pukaskwa National Park.